Days on market continue to reflect strong demand, with median days on market for sold homes at roughly 3 weeks. The number of transactions is still behind the pace of record year 2013, consistent with the trend I discussed in the July article. The lack of available inventory continues to be a factor. 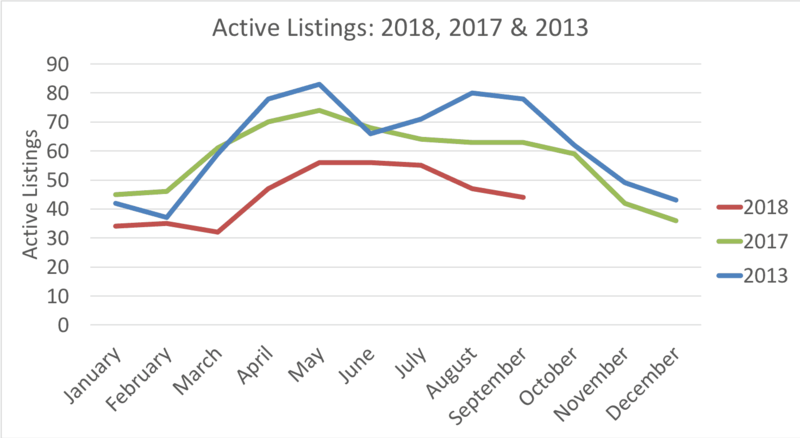 Nearby is an updated graph that shows active listings by month, 2018 YTD, last year and then 2013 (the most active year for transactions in the last 10). If you want to make sense of what’s going on in the market, or would like a better understanding of what your own home is worth, please contact me and I’d be happy to help you. You can also find additional analysis and updates to this article on treymcwhorter.com.